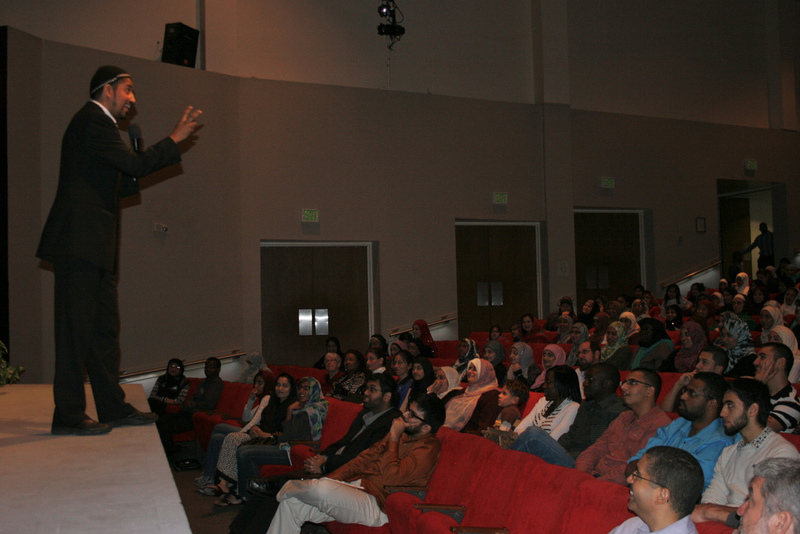 The Muslim Student Association at Valencia’s East Campus hosted its first conference, highlighted by Wisam Sharieff, a prominent Muslim American with an unorthodox speaking style and an ambitious plan for international peace. “We don’t need more words; we need more love,” said Sharieff. “But love doesn’t have its own language, yet.” He addressed the gathering of more than 500 Muslim Americans from the local community and MSA groups from UCF, USF, Rollins and more. They came out to this conference to address complicated religious issues such as the proper use of modern technology. Sharieff has an idea that expands the United Nations International Day of Peace to a long break in the near future of up to four months of international peace. The concept was equated to parents that have children who are fighting will separate them to let their tempers cool down. He is planning to meet and speak with Arabic leaders in Pakistan, Saudi Arabia, London, and elsewhere to expand on this concept of unified peace. Though it can be dismissed as an over-zealous or unattainable goal, you can not deny that it’s ambitious, especially for a young anthropologist relatively new to public speaking. For 10 years Sharieff was in and out of hospitals battling illnesses, and spent his time studying the lessons of the Bible, Torah, and Koran. It was during this period he developed his plan for peace and an international language (like American Sign Language) to unify the world through basic human understanding. Other topics addressed at Saturday’s conference were staying away from being judgmental, stereotypical, or negative and how to deal with situations involving these behaviors. 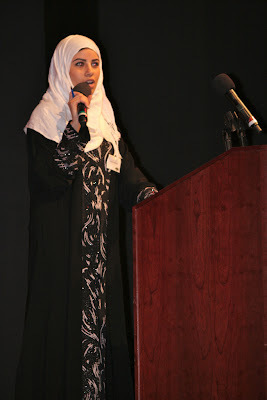 Included in the agenda was a long discussion on “The Beauty of Hijab” with its dress and personal requirements, purpose and function. Another topic of discussion included the relatively new stigma of finding a balance in the over saturation from social media web sites and smart phones. Some participants fear many younger Muslims are acting conservative in public, but behaving differently behind the anonymity of a computer screen. This is tied directly into the goal of the Muslim Student Association to inform, educate, and enlighten others concerning the Islamic religion. “Our goals are dispelling misconceptions that people may have about our religion,” said Amir Khan, president of MSA on East Campus. “People think we’re all like terrorists, or all Muslims are from the Middle East, it’s obvious that’s not the case.” Khan’s family is originally from South America and has no family ties to anyone overseas. Aside from informing students and helping with campus events MSA recently raised $1,000 to help with the people of Somalia. “We have 'Project Downtown' where every two weeks we go to downtown Orlando and cook food, make sandwiches and feed the homeless,” said MSA member Manar Isis. The main goal of MSA is spreading a positive message and helping the college meet its goal of embracing diversity. “We have students from around the world, and different cultures within MSA,” said Valencia professor and MSA adviser, Yasmeen Qadri. “It’s so important that we are all on the same page, and working towards the same goals." 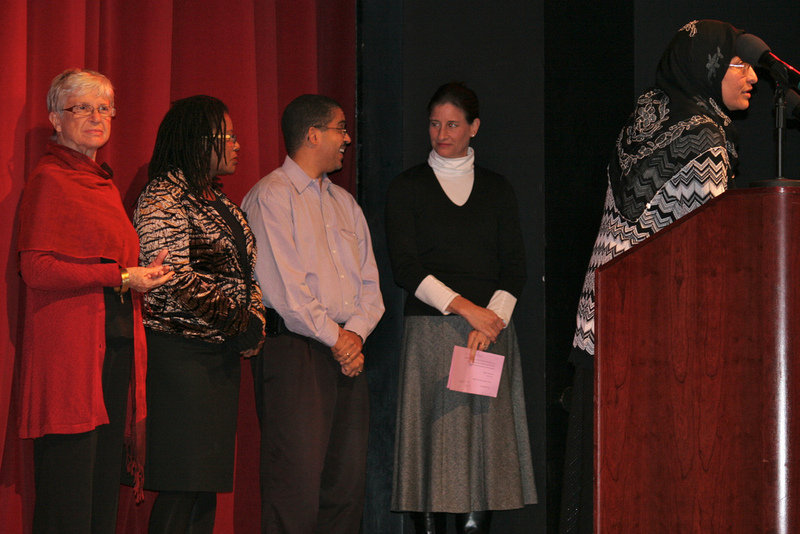 East Camps President, Ruth Prather, (left) and other faculty speaking at the conference.